Change up your games with enhanced Battlezone Terrain rules in Chapter Approved! 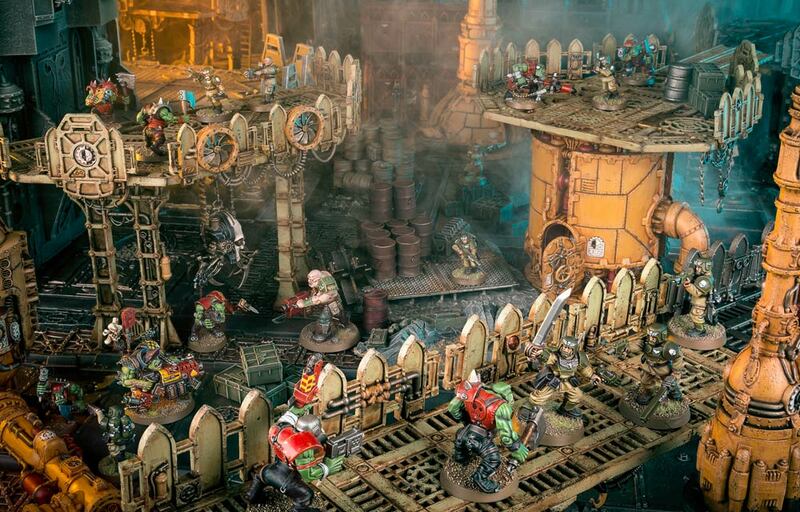 The Warhammer 40,000 terrain rules are very streamlined from previous editions and while many players enjoy the straightforwardness of the terrain, folks have been asking for “some deeper rules” to spice things up. That is where the new Battlezone rules in Chapter Approved step in. 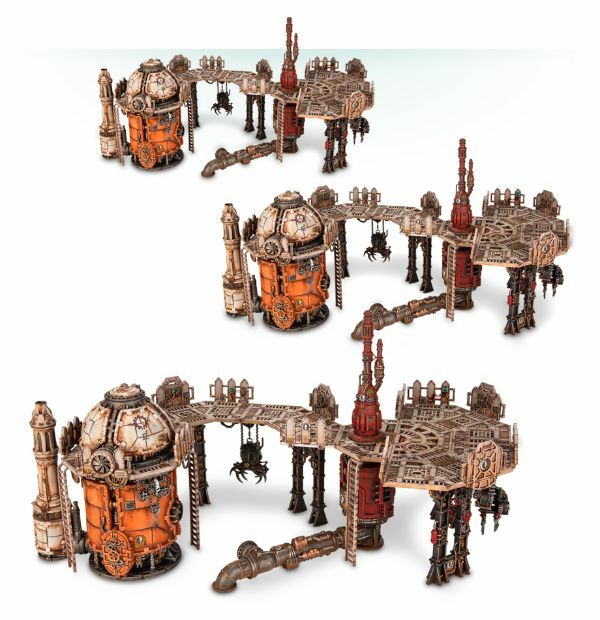 In Chapter Approved, you’ll be able to take full advantage of your collection of Sector Mechanicus terrain with a range of new rules, while every gamer can try the new Battlezone: Empyric Storm, simulating combat at the heart of a raging warp-vortex. These new Battlezones rules will be usable in all three types of play: Matched, Narrative, and Open. They will offer new stratagems to use, new thematic effects that impact the table, and new datasheets with extra rules for your in-game terrain. 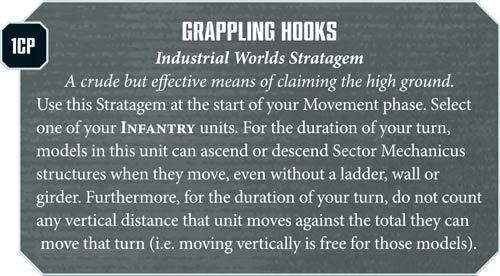 For example, the Industrial Terrain will have 7 new Stratagems which aim to open up some more tactical options when you’re moving around these crowded Forge Worlds. For those of you who want to fight battles in the middle of a Warp Storm, the new Empyric Storms Battlezones will have a new chart you can roll on that will determine what table-wide effects will kick in to mess with you AND your opponent. Some of these effects are beneficial, some of them are not – the good news is the effect will be labeled so you know when it triggers and how long it lasts. 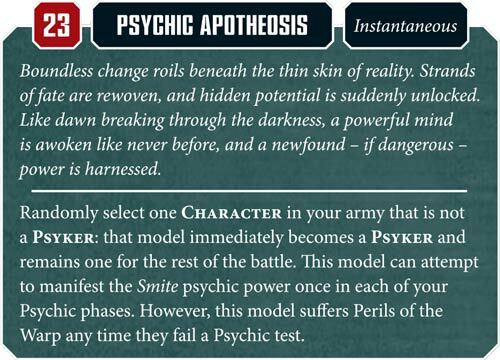 Psychic Apotheosis turns one of your non-Psyker Characters into a Psyker! They are granted the Smite psychic power for the remained of the game. Be warned: If they ever fail their Psychic test, they suffer Perils of the Warp! 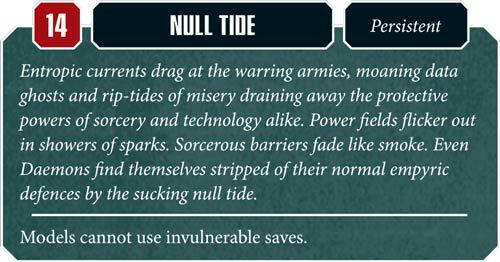 Null Tide is an example of one of those Table-wide effects – it turns off everyone’s invulnerable save! This might mess with some armies more than others (looking at you Daemons) but that’s just part of the randomness of fighting in the Empyric Storms! Chapter Approved is slated to go up for Pre-Order this weekend – are you ready to dive in?